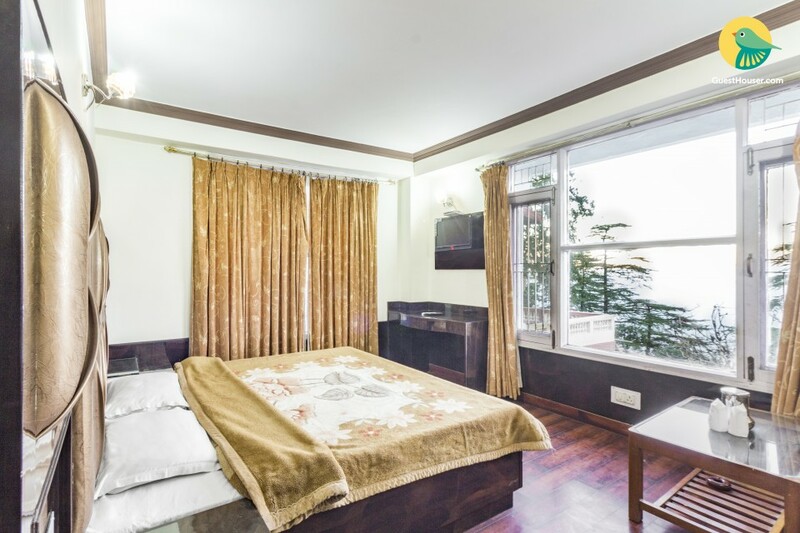 Located at a bit of a distance from the crowded streets of Shimla, this boutique stay is ideal for a couple looking to enjoy a peaceful holiday in the mountains. 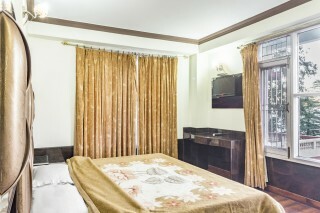 This property is located about 3 km from Mall Road and the room on offer can accommodate up to three people. The room on offer features wooden flooring and is furnished with a plush double bed, two bedside tables, a spacious wardrobe, and a writing desk. There are two sofa seats and a glass-topped table placed next to the large window in the room. Enjoy the overwhelming view with a hot cuppa in hand! There is a long mirror for your convenience. 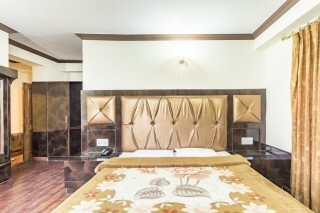 The room is equipped with a flat-screen television for you to follow your faqvourite shows even while on holiday. The en suite washroom is tiled and well-appointed with western sanitary ware and modern fittings. Complimentary Breakfast will be provided. Guests are requested to provide valid ID proof at the time of check-in. The boutique property is located on the cart road which is Less than a Km from the mall. The distance between these two places would be around 3 kms only. St. Mary's church is on mall road. The Shimla state Museum is also 3 kms from the boutique property. Nextly, the very famous ridge at Shimla is nearly 4 kms far. To visit town hall you would have to travel 4kms only. The summer hill and the Woodville are nearly 6 kms from here. 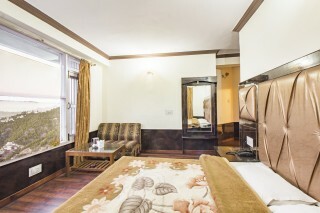 It’s a guest house built amidst the beautiful mountains, providing a homely environment to travellers. 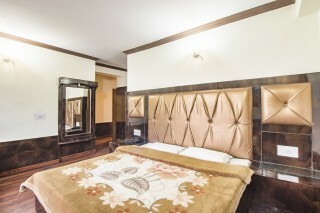 The interiors of the house comprise of wooden floors, spacious rooms with comfortable beds and neat washrooms. 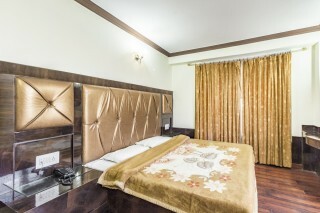 You can avail all the basic facilities like television, Wi-Fi and newspaper etc., required for a comfortable stay along with round the clock travel assistance and pick up and drop off facilities. 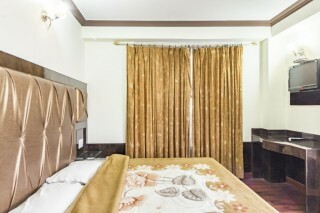 In-room dining facility along with laundry and dry cleaning services are also provided. It is conveniently located near famous landmarks like the Mall, St. Mary’s Church, Summer Hill, Woodville and Town Hall etc. The property is best suited for people looking for a peaceful environment and stay connected to the city at the same time. We had a really good stay and liked the place.The rooms were clean and services from the attentive staff were also good. Although we faced some difficulty in getting a parking place, the host was sweet enough to sort this out for us. Everything was just perfect here, and we felt right at home! Shimla Railway Station is 2 kms. Shimla Airport is the nearest domestic airport and it is in round numbers 21 km away. Whereas, the Indira Gandhi International Airport is 365 kms from here. Bus Stand is around 2 kms distant.